This great boat offers a newly refurbished engine, fitted in February 2019 and she is also freshly anti fouled. She has a large cockpit, with plenty of room, complete with full cockpit enclosure - this gives extra room, warmth and shelter for the occupants. Her basic accommodation offers up two berths, or a double with infill and somewhere for a couple or friends to spend the weekend, whilst enjoying some high speed water sports fun or fishing trips. With a good clean of her cockpit and interior, you could grab yourself a good looking and fun boat to enjoy the summer with family or friends. "Her engine is a fully serviced replacement, new timing belt, all coolers stripped, cleaned and rebuilt, new filters and belts etc. 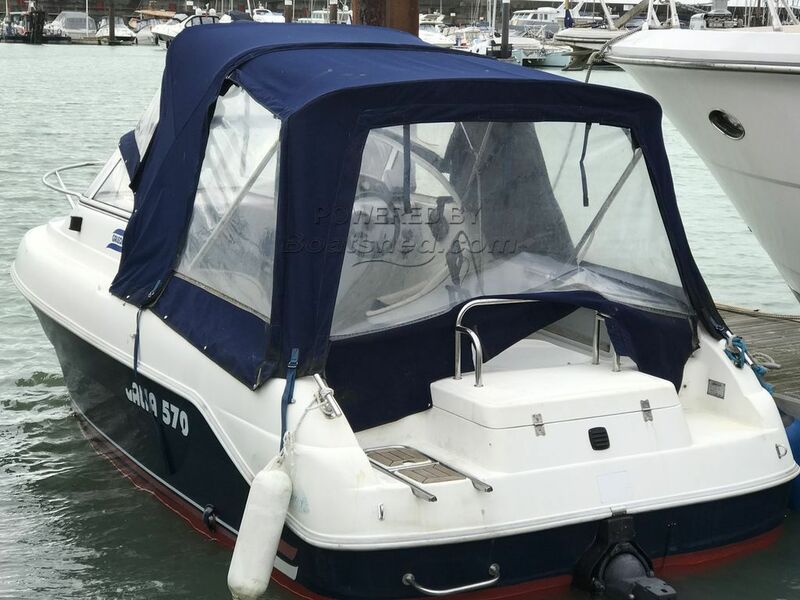 Transom shield rebuilt with new steering seals, new bellows and water hose, new trim senders and shift cable, new anodes, new drive oil and impeller, new bilge pump." This Galeon Galia 570 has been personally photographed and viewed by Tim Kingston of Boatshed Brighton. Click here for contact details.